UXBRIDGE, Canada, Nov 2 2012 (IPS) - Killing nearly 200 people in the United States, Canada and the Caribbean and crippling much of New York City and surrounding areas earlier this week, Hurricane Sandy was the kind of extreme weather event scientists have long predicted will occur with global warming. Sandy was twice the size of an average hurricane, and it hit the eastern coast of the United States, where sea levels have been rising the fastest, said Kevin Trenberth, senior scientist at the National Center for Atmospheric Research in Boulder, Colorado. Oceans and the earth’s atmosphere have warmed significantly in the last 50 years due to hundreds of millions of tonnes of carbon dioxide (CO2) emitted from burning coal, oil and natural gas. CO2 acts as blanket, keeping the planet warm by trapping some of the sun’s heat. The extra heat contained by the CO2 blanket is akin to exploding 400,000 Hiroshima atomic bombs every day, according to James Hansen, a climate scientist who heads the NASA Goddard Institute for Space Studies. Most of that heat has gone into the oceans, so land temperatures around the world have risen an average of only 0.8 degrees Celsius (one degree Fahrenheit). As oceans warm, sea levels rise because warm water expands. Melting glacier and ice sheets are also major contributors to sea level rise. Warmer air can also hold more moisture. Measurements show there is now four to six percent more water vapour in the air, making rainfalls heavier. Hurricane Sandy’s path took it from the warm waters of the Caribbean up the Atlantic coast of the United States, where waters were exceptionally warm for this time of year. Hurricanes are largely fuelled by warm water and moist air. Sandy had plenty of both. Higher moisture levels created a stronger storm and magnified the amount of rainfall by as much as five to 10 percent in comparison to conditions more than 40 years ago, Trenberth explained. Just one year ago, Hurricane Irene slammed into New York City, closing its subway system and forcing the evacuation of 370,000 people. 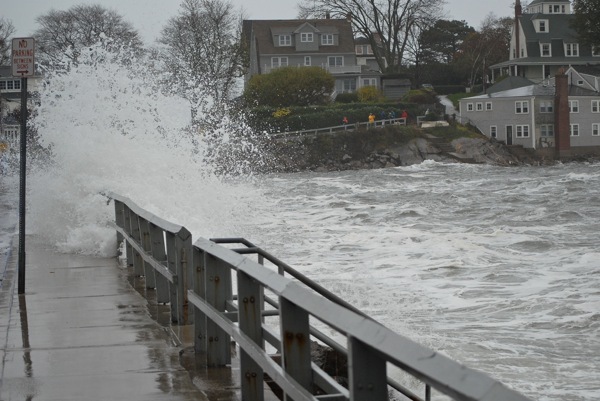 Irene then moved inland to Vermont and New Hampshire, where it produced record flooding. Total damages were estimated at 16 billion dollars. Sandy’s cost is estimated between 50 and 60 billion dollars, an amount second only to Hurricane Katrina, which hit New Orleans and the Gulf Coast on Aug 29, 2005, killing 1,836 people and destroying roughly 300,000 homes. It caused nearly 120 billion dollars in damage, with its total cost to the U.S. economy estimated at 250 billion dollars. These extreme events will only worsen as temperatures continue to rise. Yet CO2 emissions are still increasing quickly, driven by the oil, gas and coal industries. In 2012, more than $600 billion will be spent worldwide in oil and gas exploration and production, said Steve Kretzmann, executive director of Oil Change International, a U.S.-based non-governmental organisation. “The reality is that the oil industry is driven by reaping profits from new production sites,” Kretzmann told IPS. Massive investments in deep water drilling, tar sands and new oil and gas extraction technologies such as horizontal fracturing are driving production levels to new highs. An analysis by Oil Change International found that those investments by fossil fuel companies and their backers put the planet on the path for temperatures to rise at least eight degrees Celsius. Leading scientists consider a temperature increase of four degrees Celsius to be catastrophic. At those temperatures, the Arctic will be eight to twelve degrees Celsius warmer. Most of the carbon-laden permafrost will thaw, with disastrous positive feedback. A rise of six degrees Celsius would render large parts of the world unlivable. Hardly anyone has considered the consequences of eight degrees. “The world needs to aggressively invest in oil demand reduction rather than a continued unsustainable binge,” Kretzmann said. But such change, which seems unlikely in the near future, occurs, the world will be forced to deal with the consequences. And PATHETIC what we farmers were cutting, raking, and baling up to have as winter fodder for livestock. Baling road ditch grass and anything we could get rights to bale, that in the past we’d have never dreamed we’d be grateful to bale and put in storage..
I’m sorry to hear of your troubles with the drought. Farmers are on the front lines. However there is no real science pointing to earthquakes as the reason for the rise in extreme weather. I have interviewed hundreds of scientists over the years and there is no doubt that burning fossil fuels are changing our climate. We can’t do anything to stop earthquakes but we can easily cut back on our use of coal, oil, and gas. the CLIMATE CHANGE, GLOBAL WARMING and the sequences.